There is the case. Someone changed his Android to iPhone 8. He decides to sell the Android phone for extra supply of changes, so he has to clear up all data saved on the phone. He thinks Factory Reset may work, but before that he want to transfer the photos from Android phone to iPhone 8 because most of these photos symbolize the good and meaningful memories. If the number of photos is small, he can transfer them one by one manually. However, there are about two hundred of them which makes transfer seem a little complicated. If I were this person’s friend, I would recommend him to apply Mobile Transfer to transfer photos from Android to iPhone 8 without any hesitation. Why? 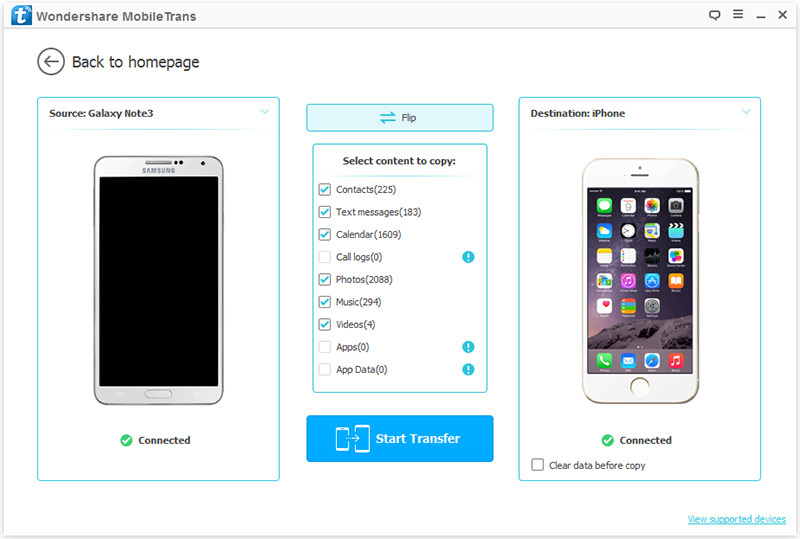 Because Mobile Transfer enables users transfer any file types in simple process. It supports transferring data between different phones with one click, including iOS, Android, Symbian, and WinPhone. What’s more, the whole transfer is safe and reliable because it won’t cause the leak of personal information. 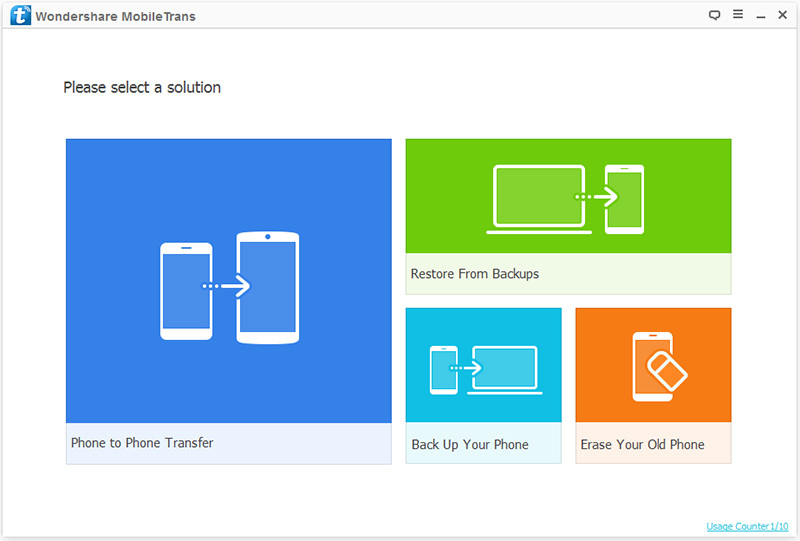 Now, let's see how to transfer photos from Android to iPhone 8 effciently with Mobile Transfer. Launch Mobile Transfer on the computer and enter "Phone to Phone Transfer". Next, please get your Android and iPhone 8 connected. When connection is successful, both of your devices are recognized by Mobile Transfer and you can see the images of your devices on the page. The data will be transferred from the source device to the destination one. Please check their position. If wrong, you can use the "Flip" button to exchange it. Mobile Transfer shows the supported file types in the middle of the images. You can see types and the number of the file. Please check Photos and select it. Then click on "Start Transfer" button to begin transferring. As a rule, the transfer will finish within a few minutes and the photos will be transferred completely from Android to iPhone 8. Please keep your devices connected along the process. In addition, you can check the "Clear Data before Copy" box if you want to erase data on the destination phone before copying the new data. This article will tells how to directly transfer all data like contacts, phone number and more from any Samsung Galaxy phones to iPhone 8 in one click. Directly sync all data including contacts, SMS, photos, videos, calendar, apps and more from old iPhone 4S/5/5S/6/6 Plus/6S/6S Plus/7/7 Plus to iPhone 8 in a click. Directly transfer all data including contacts, text messages, photos, videos, call logs, music, apps and more from iPhone 4S/5/5C/5S/6/6 Plus/6S/6S Plus/7 to iPhone 8 in a click. Directly extract and transfer data including contacts, text messages, photos, videos, call logs, music, calendar, apps and more from iTunes and iCloud backup to iPhone 8.
iPhone Data Transfer, directly switch calendar and more data from iPhone 4S/5/5C/5S/SE/6/6 Plus/6S/6S Plus/7/7 Plus to iPhone 8 with a click.